When we first met you, we expressed concern that our unhealthy lifestyle was interfering with our ability to keep up with our four year old son. As a middle-aged executive with a high stress job, Alan was concerned he was too out of shape to ever hope to play baseball with him. 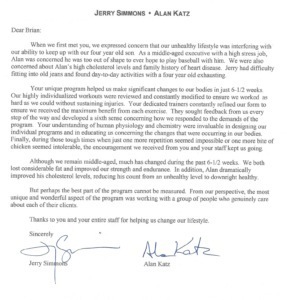 We were also concerned about Alan’s high cholesterol levels and family history of heart disease. Jerry had difficulty fitting into old jeans and found day-to-day activities with a four year old exhausting. 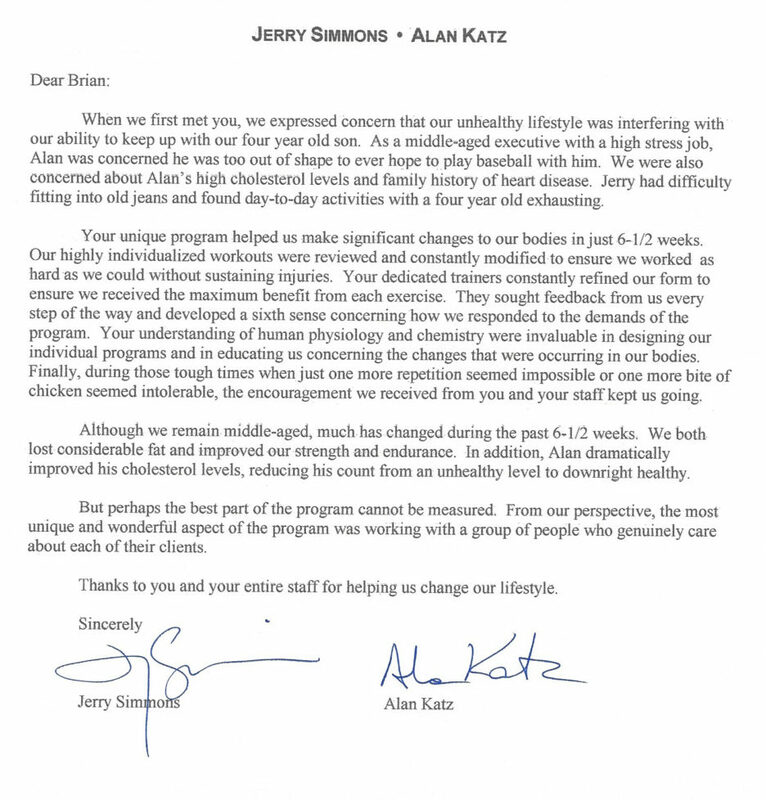 Your unique training program helped us make significant changes to our bodies in just 6-1/2 weeks. Our highly individualized workouts were reviewed and constantly modified to ensure we worked as hard as we could without sustaining injuries. Your dedicated trainers constantly refined our form to ensure we received the maximum benefit from each exercise. They sought feedback from us every step of the way and developed a sixth sense concerning how we responded to the demands of the program. Your understanding of human physiology and chemistry were invaluable in designing our individual programs and in educating us concerning the changes that were occurring in our bodies. Finally, during those tough times when just one more repetition seemed impossible or one more bite of chicken seemed intolerable, the encouragement we received from you and your staff kept us going. Although we remain middle-aged, much has changed during the past 6-1/2 weeks. We both lost considerable fat and improved our strength and endurance. In addition, Alan dramatically improved his cholesterol levels, reducing his count from an unhealthy level to downright healthy. But perhaps the best part of the program cannot be measured. From our perspective, the most unique and wonderful aspect of the program was working with a group of people who genuinely care about each of their clients. Thanks to you and your entire staff for helping us change our lifestyle.